Natural beauty and elegance should not be limited to the indoors only. We believe comfort and beauty should be extended outdoors to create an escape from daily life. Our lumber is used by architects for commercial and residential projects because of its beauty and incredible durability. This gorgeous Ipe and Garapa deck will last for years with no chemical treatment. Unmatched durability and strength make Brazilian hardwoods the perfect material for any outdoor deck or architectural application. Not only are they highly resistant to termites, mold, and fungus; all of the Brazilian hardwoods we carry have a strength that surpasses redwood, cedar and other softer woods. The best part is our wood is not chemically treated, leaving you with a 100% natural surface to walk on that’s completely safe for you and the environment. At AdvantageLumber.com, we carry five different kinds of Brazilian hardwoods: Ipe, Cumaru, Tigerwood, Garapa, and Massaranduba. All of our wood is surfaced on four sides (S4S) and eased on all edges (E4E) to create a surface that’s perfect for walking barefoot on. Ipe is one of the strongest woods available, and features beautiful light brown to dark brown colors. Cumaru is a close second in strength and density, but unlike Ipe, it’s colors range from blonde to maroon. Tigerwood is by far our most exotic species. The board itself is a light orange color with beautiful black and brown striping. Each board is unique, like a fingerprint. Massaranduba is also known as Brazilian Redwood. The rich red color that Massaranduba has makes California Redwood looked like a cheap imitation. Lifespan? Over 25 years. Cumaru deck tiles are so easy to use, and they have the same lifespan as our traditional decking options. We understand not everyone is handy with tools, and it makes no sense to hire a contractor when the area you need to remodel is small and easy to work with. 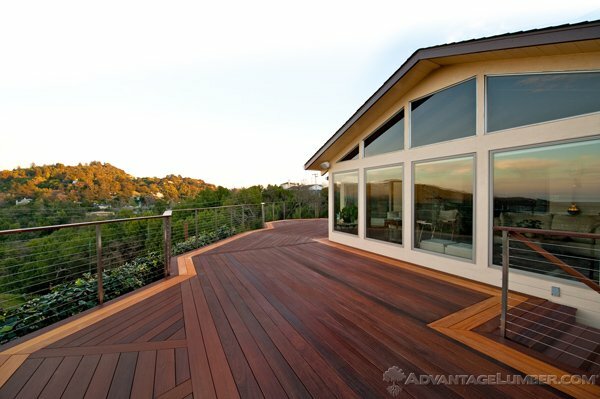 For those reasons we have our Advantage Deck Tiles™, which are made with the homeowner in mind. Our deck tiles are available in two different sizes, 24 x 24 for Ipe and FSC Massaranduba or 20 x 20 for Ipe, Tigerwood and Cumaru. 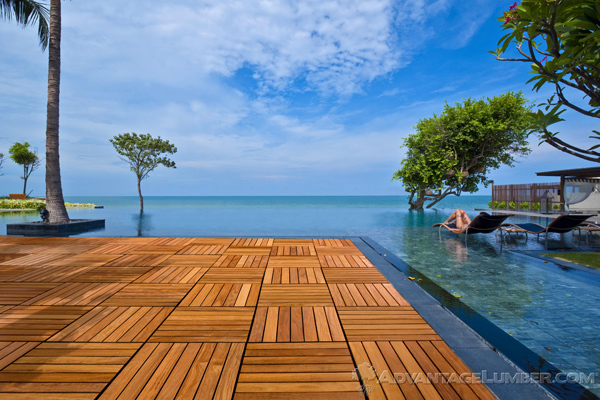 The tiles are made from the same premium quality Brazilian hardwoods and are extremely easy to install with DeckWise™ Deck Tile Connectors. Every tile is has a hole in each corner designed to snap easily in place with the deck tile connector. No screws, no hassle, no guess work. Our Advantage Deck Tiles™ are the perfect way to transform your outdoor space without spending a fortune on labor and materials. At AdvantageLumber.com we believe in providing you with the best quality wood in all shapes and sizes. We carry everything necessary to build a deck or transform a concrete patio into a beautiful oasis. Call or visit AdvantageLumber.com to find out more about our products. This entry was posted in Decking Tiles, Exotic Hardwood, Wood Decking and tagged Brazilian Decking, Hardwood Decking, Ipe Decking on January 4, 2014 by Mr. Ipe Hardwood. I like the Ipe deck tiles, 24 x 24. What would it cost for a deck about 500 sq ft? I am on the beach in Cape Meares close to Tillamook Oregon. Where is the nearest supplier? I’ll forward this on to our sales team and they’ll get back to you with a price quote. Our nearest location to you is in Santa Fe Springs, California. Which Brazilian deck board are the easiest to work with as far as sawing , drilling and routering? All our species of hardwoods have just about the same blunting effect on power tools. Using carbide tipped blades and drill bits will last longer and make cleaner cuts.